David Grover has been compared to Mr. Rogers, James Taylor, Paul Simon and Raffi, but his style is all his own. Grover has garnered over 30 awards, including Emmy and Grammy nominations. Also, he has top awards from Parents’ Choice, (NAPPA) and other non-profit groups for excellence in children’s media. He has performed at the White House, the Goodwill Games, The Today Show, the Detroit Symphony and the United Nations. To hear this living legend is to instantly become a “Grover Groupie”. This prolific singer/songwriter’s Chanukah At Grover’s Corner (featuring Theodore Bikel) received a Regional Emmy and has been played on PBS Stations at holiday time for years. 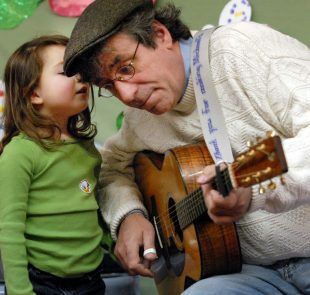 His original Jewish Holiday Songs have become a staple for such venues as The Jewish Museum as well as Synagogues, JCC’s and Jewish Day Schools and Camps around the country. Folk music of the 21st century.